I had to lower my loss floor! Note that the bottom of the graph is now at 97%. Things looked much better on Wednesday, when SPY was down to 100.4% and I was up to 99.9%; only one more good day and I would be beating SPY year-to-date! Alas, it was not to be. Now I have to decide whether to discontinue trading and maybe lie low for awhile. It pained me to sell DRETF, but SPY has been down for three of the last four weeks and DRETF has a positive beta so “the market” will drag it down. I sold at a small profit; hopefully I can buy it back someday. 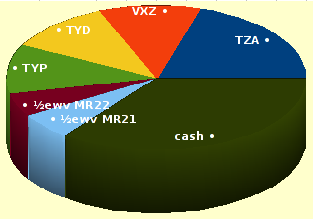 TZA, VXZ, and TYD all gapped up at the open on the days when I bought, so my stops ended up being much more expensive than planned. 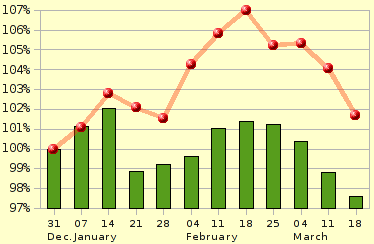 EWV and TYP were bought during the day to avoid this. For TZA, I had planned to sell off chunks during the upward spike that was supposed to occur (but didn’t), then I would buy up some replacement shares when the price came back down. Instead, only the “buy” triggered so now I have lots of TZA with an uncomfortably-deep stop depth. I bought EWV because “The average stock in Tokyo will go down after the Fukushima earthquake” seemed like a sure bet. The Nikkei did indeed go down, but it was sickening to watch so I didn’t want this stock anymore after the first day. Also it seems that EWV has become detached from its index since the quake and is trading at values that are abnormally low. On Friday I switched from use daily-pSAR to weekly-pSAR for stocks that I intend to keep for awhile. This was a huge increase in stop-depth for TYP. No stocks sold last week are worth more now than they were last Friday. All of the stocks I currently own started rising on FE 22, so they might all stop out on the same day, leading to a horrible 5% overall loss for such a day. I’m sitting on 47% cash, but I don’t want to buy anything until I can cut my risk. Thankfully “the trend is my friend” and the expected direction for TZA is positive.